There are many popular musicians who have followed a drink- and drug-fuelled pathway to an early death but few, if any, who have done it as publicly as Amy Winehouse. In the same way that he did with his earlier film, Senna, director Asif Kapadia has woven a highly affecting picture from contemporary footage taken from a variety of sources, including home movies, news items, fans’ mobile devices and camcorders, and an ever-present video camera in recording studios, cars and hotel rooms. There is no commentary but the visuals are regularly overlaid by the voices of participants in Amy’s story. At the time of her death there was much criticism of the paparazzi’s intrusive behaviour but Kapadia’s documentary makes clear that the causes of the star’s death were multiple and complex, and that the seeds of her destruction were sown much earlier. Winehouse appears to have been a wilful force of nature, even as a child. She describes herself as uncontrollable once her father had left home. As a teenager she was bulimic. Winehouse cheerfully states that her real ambition is to be singing jazz in clubs. Fame, she says early on, is something she wouldn’t be able to cope with but the success of her first album and the touring that follows means fame is unavoidable. From this point on Winehouse’s life is complicated by a dangerous cocktail of negative influences, including an obsessive relationship with Blake Fielder, heavy drinking and drug-taking, and the reappearance of her father who becomes involved in her professional life in a not wholly helpful fashion. What I found particularly disturbing is the way that, as both Fielder and Winehouse begin to fall apart in front of the world’s cameras, they are treated as a source of laughs by various popular television comedians (the guilty parties include Graham Norton and Jay Leno; by contrast, former drug addict-turned comedian Russell Brand tried to get Winehouse to rehab). As someone who was only passingly familiar with the music of Amy Winehouse this documentary made clear what a huge talent and charismatic star she was. None other than Tony Bennett hails her as one of the all-time great jazz singers. 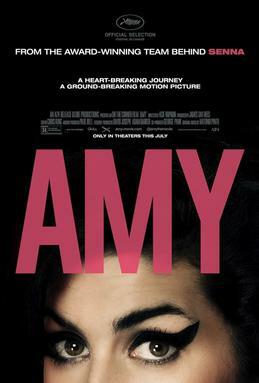 Amy is a gripping tale of a brilliant life cut tragically short. 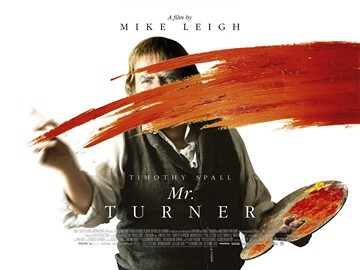 Cast: Steve Carell (John du Pont), Channing Tatum (Mark Schultz), Mark Ruffalo (David Schultz), Sienna Miller (Nancy Schultz), Vanessa Redgrave (Jean du Pont). Full of dark foreboding right from the start, Foxcatcher is definitely not one of this year’s feel-good movies. This is a story of loneliness and family tensions, and shows that for some people no amount of wealth can bring happiness. In the opening scene we see Mark Schultz (Channing Tatum), giving a lacklustre talk to a hall full of puzzled schoolchildren about what it took him to become the 1984 Olympic gold medallist in freestyle wrestling. Afterwards, he collects his cheque from the school administrator, who mistakes him for his brother Dave (also a gold medallist, and who had originally been booked to talk). This moment is indicative of the relationship between the two brothers. We learn that Mark was raised by his older brother after their parents separated, and that Mark relies on the tactical advice of Dave (Mark Ruffalo) in order to succeed in wresting. Whereas Dave is cheerful, gregarious, and has a wife and family, Mark lives alone, is quiet, serious, and less articulate. 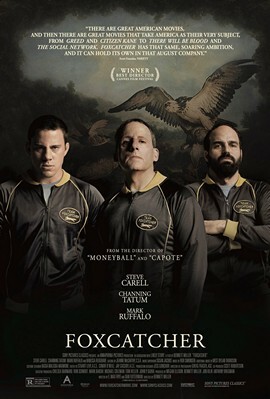 Mark is approached by John du Pont, heir to America’s wealthiest family, to join his Foxcatcher wrestling team. He does so, but when brother Dave is also approached he declines to answer the call because he doesn’t want to uproot his family. Subsequently, du Pont takes on a fatherly role towards Mark, deliberately playing on his insecurity that his success is owed to Dave. But underneath all his talk of leadership, du Pont is also insecure, the product of a troubled background. He only had one friend as a child, who – it turns out – was paid to be his friend. He hates horseriding, the favoured sport of his mother Jean (Vanessa Redgrave) who still lives on the estate and manages a large stable. In turn, she regards wrestling as a ‘low’ sport and looks upon her son’s involvement with disdain. 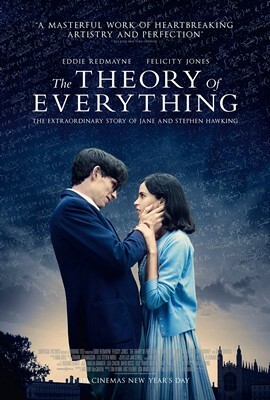 Although she only makes a couple of brief appearances in the film, it is strongly hinted that the difficult mother-son relationship underpins John’s increasingly erractic behaviour, leading ultimately to tragedy. Jean would appear to be the ‘foxcatcher’ of the title, a reference to her involvement in hunting with hounds. After some early success, everything starts to go south for Mark. Du Pont introduces him to cocaine with predictably disastrous results and Dave is offered a sufficiently large sum of money to induce him to join the Foxcatcher team. The already unsettled team dynamics worsen further following the death of Jean. Steve Carell, best known for his comedy roles (The 40 Year Old Virgin, The Office), is a revelation as John du Pont. From the outset he appears only partly connected to reality, with a way of speaking that is strangely distant and affectless. One of the oddest moments occurs early on, when du Pont turns up at Mark’s house late at night to talk about bird-watching, a topic on which du Pont has written books. He tells Mark: “You can learn a lot from birds. I’m an ornithologist. I’m also a patriot”. The flunkies around du Pont are mostly unfriendly and uncommunicative, presumably not wanting to openly comment on their boss’s oddness but yet happy to collect their handsome salaries. Dave rightly asks just why this wealthy man would be interested in creating a wrestling team. The answer would appear to be that he hopes to receive the recognition from his country that has been denied him by his own mother. Foxcatcher moves along at a fairly stately pace, building an atmosphere of strangeness and slowly revealing the complicated relationships of the key characters. For those more used to a punchier kind of pacing in films, Foxcatcher might seem a little slow, but I found it utterly magnetic albeit gloomy. As well as Carell’s outstanding performance, Channing Tatum also turns in an impressive performance as Mark Schultz. You wait ages for a film about a woman trekking alone through the wilderness and then two come along at once. The obvious comparison for Wild is Tracks, another single-word title that appeared earlier this year (and reviewed here on 23rd April). I think Tracks was very underrated, but those who couldn’t relate to its somewhat abrasive protagonist, especially given the almost non-existent backstory, might be more warmly disposed towards Tracks. Scripted by Nick Hornby, and based on Cheryl Strayed’s memoir “Wild: From Lost to Found on the Pacific Crest Trail”, this is a story where the heroine’s past is a prime motivation for the journey she undertakes. Reese Witherspoon plays Cheryl Strayed, in what is her most substantial part and performance since Walk the Line. The film opens with her partway through the journey, sitting on a rocky outcrop, peeling off bloodstained socks and then ripping off one of her toenails. Glamorous it isn’t. This is about as far away from the ditzy blondes of Witherspoon’s early roles as it’s possible to get. From this point we flash back to the journey’s starting point, which builds sympathy for Strayed in a comical scene where she struggles to stand up in the huge overfilled backpack that she is wearing. We then follow her along the journey, but with regular flashbacks to her earlier existence. Laura Dern appears as Cheryl’s mother, Bobbie, who has escaped a relationship with an abusive husband and is now enrolled as a student in the same university as her daughter. There is also an ex-husband Paul (Thomas Sadoski) who Cheryl does not seem to have got over. However, tragic events lead to Strayed’s life going off the rails. In undertaking her ambitious trek she is trying to become a different sort of person. Needless to say, there are hardships, mishaps and dangers that have to be faced, although nothing as extreme as in films such as 127 Days or Touching the Void. But this is less an adventure film than a film in which adventure plays a part. What really matters here is the transformation of the heroine, a change that is brilliantly, and movingly conveyed by Reese Witherspoon in a performance that could stand her in contention for the Oscars. 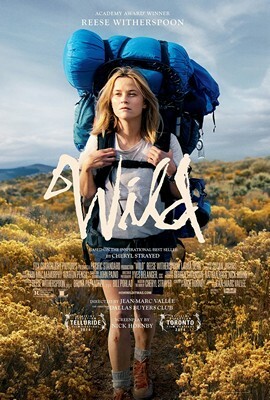 Wild was shown as part of the London Film Festival. 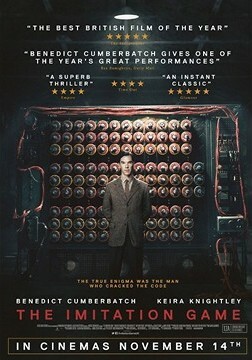 The UK release date is January 2015.